Adam, a self-proclaimed “artist and architect,” develops his projects as a form of “upcycling” — a way of taking something designed and built for a specific purpose and recontextualizing it. His personal website, architecture and hygiene, features some of his many home projects, including a simplified $99,000 house, a huge, sprawling home built from 12 shipping containers (which he’ll rent to you for $6-10k/week between the months of June and October), and a tiny “pushbutton house” built from a single container which folds up to protect its contents, but opens for pure outdoor living. But what really caught my eye is his Quik House, pictured below. The design is remarkably similar to Flynn’s house in Tron, built from three containers stacked crosswise upon two, leaving room for two big rolling doors on the front and back. He’s configured the layout similarly, too, at least from what we can see online, setting a living room downstairs between the two doors with a kitchen off to the side on the first floor and a bedroom and other living areas upstairs. Overall size is dictated by the containers: 40′ x 24′, and much of the container sides are left intact upstairs, dividing living areas mostly into 8′-wide spaces. Trolling about a bit more, though, one can find numerous variants, including versions with large cuts in the upstairs walls, creating at least one fairly large room. Most configurations feature a single winding staircase on one side, but some include more complex straight-stair designs. The bad news, from what I can tell, is that the Quik House works pretty much like a kit car. It may seem inexpensive on the surface, but it’s not designed to save anyone money. It’s designed for customization. Current pricing, assuming you’re willing to hop on Kalkin’s six-month waiting list, starts at $76,000, and at that price point you don’t even get the equivalent of the kit car “rolling chassis.” The “kit” includes “six modified containers, stairs, walls, pre-fitted electircal and plumbing systems, and aluminum glazing frames.” Buyers will need to provide “everything in the ground” plus whatever’s necessary to finish the roof, make electrical and plumbing connections, and finish the walls. Bottom line: Kalkin recommends budgeting between $125 and $165 per square foot for the entire project (excluding land). That’s about twice what I paid for my mid-grade suburban home. Still, this design is inspiring, and shows that building such a home entirely on one’s own is certainly doable. 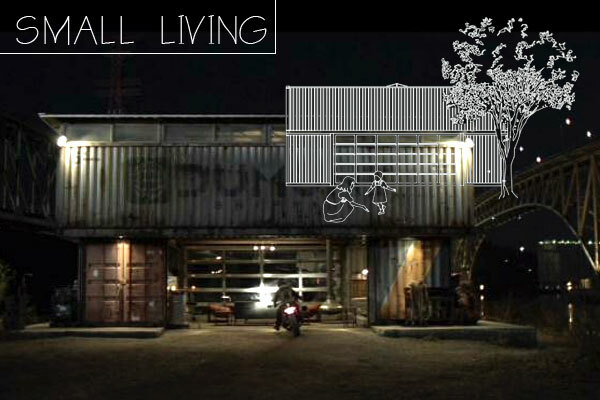 Building a home from containers raises some serious issues for most folks, ranging from difficulty in meeting architectural and building codes to convincing others in the area that containers aren’t just for hobos. But the idea of a small, efficient (both in terms of resources and space) home strikes me as a seriously cool deal. Plop something similar down on a lake or near the beach, and I think I’d be quite happy in it. I’ll keep researching. If you’ve built a container home, or another small-living-style home, I’d love to hear about it. This guy has a lot to say about container homes – and my impression is that they can be a LOT cheaper! saw on tv about homes being built from containers in either new zealand or australia. i think it would work best for a very good handyman. One of the problems with this design is the above 40ft container spanning sideways on top of 2 x 20 ft containers is they will need extensive modification to support the bearing weight. Shipping containers are designed to be load bearing in the 4 corners. without support beams added this design would be considered structurally week. Can you elaborate? I don’t see what the problem is. Aren’t all three of the top containers in this design (background of the second image) supported at each corner? Or are you saying that having an upper container resting on the middle of a lower container is weak (because the lower container is bearing the load at a point other than its corners)? Yes, I think that’s what he’s saying; that the outer two containers at ground level will sag in the middle if they’re not reinforced. some strategically placed vertical reinforcement would solve the issue. The above design has 40 ft containers supported by 2 8 ft containers at each end. A company called SGBlocks has a unique approach to this. They retrofit the containers for a specific project – this includes structural support and insulation etc. As a result many of their projects don’t look at all industrial (though some do). Not sure of their pricing. Insulation would be my biggest worry, by the time you put in serious insulation, the interior spaces will be much smaller. I do a lot of HVAC work in Refineries, they use a lot of shipping containers as temporary shelters. On a really hot day, it’s almost impossible to keep them cool. Don’t even get me started about winters, any exposed metal on the inside is covered in frost. I live in Southern California and I’m seriously considering replacing my house, which is being consumed by termites, with containers. There’s a three story building built of 20′ containers about a mile from my home. It has large picture windows, through which you can see finished ceilings and an open floor plan. Also, there are thousands of these things arriving weekly from China at the Port of Los Angeles and Long Beach, and the same volume isn’t being shipped back. As a result, empties are piling up, and they’re quite affordable. Given our mild climate, a 2×3 steel stud wall with foam-in-place insulation will provide sufficient r-value, and the 8’6″ ceiling height for a 9’6″ container offers plenty of room for finish floor, ceiling and insulation, while giving me higher ceilings than I currently enjoy. One alternative to adding an internal steel ‘skeleton’ to add structural strength might be the use of screen block. Such should provide the needed reinforcement for the lower containers and add a nice material contrast to the ‘raw’ steel’ surfaces. i would think that using the containers in a square surrounding a central patio would be a great way to have a home. double wide sections for the living room area with the interior dividing walls removed between containers. there are a lot of damaged containers around also.. if the base is still flat. cutting the at a 30 degree angle to create a roof section to get rid of the box look from the street. leaving the tops open for racks of solar panels and HVAC systems. another is to create short containers for filling with styrofoam. creating floats to go under your house in flood prone areas. having some steel poles and guides on the corners to keep them in place as they float during floods. the steel pipes would need to be filled with concrete for strength after installing. one would only need two for most applications. they have floating housing in holland. this might also work to prevent being tossed around by tornados. if there is a stop on the pipes. 20 or 28 foot versions with welded on expanded metal grids and spray cement applied. to make them bullet resistant for mountain cabins. but still deliverable. foam layer on the inside as insulation. i don’t know why some people see something like a side of a barn and want to shoot at it. jimmy proof locks mounted high, middle and low on the door would prevent bears and trespassers. like mounting hinges on both sides of the door if you don’t know what a jimmyproof lock is..
using a double acting hydraulic cylinder with a solenoid valve to stop the flow between the lines installed overhead like a door closer. keeps the big doors closed or open unless the alarm is unlocked. no hydraulic pump. just a low voltage solenoid valve to control movement. You could use corrugated sheet roofing or even solar panels over the containers, leaving room under it for air conditioning machines for the interior. A standard 40′ (not high cube or 9’6″) container in my area (Pittsburgh, Pa) will cost about $4000 delivered. If you live near a coastline it MAY be cheaper. The HC 9’6″ containers are considered non standard and cost a bit more and are harder to acquire. I am currently waiting for spring to start my home using 2 40’HC containers offset like the trim home without the third container on top. I will use a glass garage door on one side and a standard wall with door on the other. 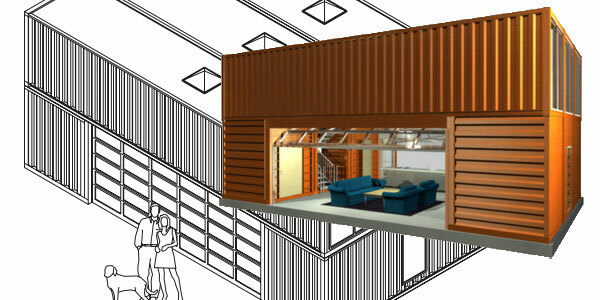 It will have a roof deck and gabled roof over the non container area. Cost not including land will come in about 62,000 with me doing most of the finishing work myself. They can be cheap forms of building, but mostly if you do your own labor as much as possible. Otherwise, they are just about the same cost as a standard home of equal size. The benefit for the environment, unique visuals and speed of building are the major benefits. And if your worried about living space reduction due to insulating and walls, you can always put the insulation on the outside of the home and use a standard facing like vinyl siding. Will, we are in the beginning planning stages of our own container home in Fayetteville, PA. Please do email me at ivymwood@gmail.com, I’d love to start a dialogue. Here in Illinois near Bloomington/Normal, we have a place that sells forty footers (high cube I believe) for Bout $2600 apiece. Hmmm thats a very cool idea!!! If youbwould like to build with containers contact me wcoastgreenhomes@gmail we design and build based in South Africa but can do a job wherever . We have used shipping containers a.k.a. Conex’s, for barracks, offices, temporary dwellings, etc. in the military primarily over seas for decades. Cheap, fast, easy, and efficient. They can be configured and customized in so many ways that they can suit budget and needs. Container structures are either for the rich or the dedicated DIYer. If you are a welder, no problem. Use new “one trip” forty-foot High Cube containers, not old beat “wind and water tight” units. Weather the new ones if you must. Someone SELLING you such a home has to at least double their money to make it worth their while and must build it in one shot. If you do it yourself you can (get permits first if required, learn what YOUR areas building code requires!) pour the slab and have power and sewer or septic run then work out of one bottom container. A new “one trip” High Cube is about five grand delivered on the East Coast. Shop around. One High Cube has roughly the space of a single wide mobile home. I use mine for shop space but I’d live in one if needed. Que tiempo has dedicado a tremendo a porte y hay cuantiosas información que no sabía que me has aclarado, esta maravilloso..
te quería reconocer el periodo que dedicaste, con unas infinitas gracias, por instruir a personas como yo jajaja.